Hello from Maui! If the blog is a bit quiet this week you'll know why. I am permanently planting myself next the pool with a book (finally started The Corrections by Jonathan Franzen) and a stack of New Yorkers that I haven't had the time to read until now. The goofy photo above was taken of me the last time I visited Maui, about two years ago. 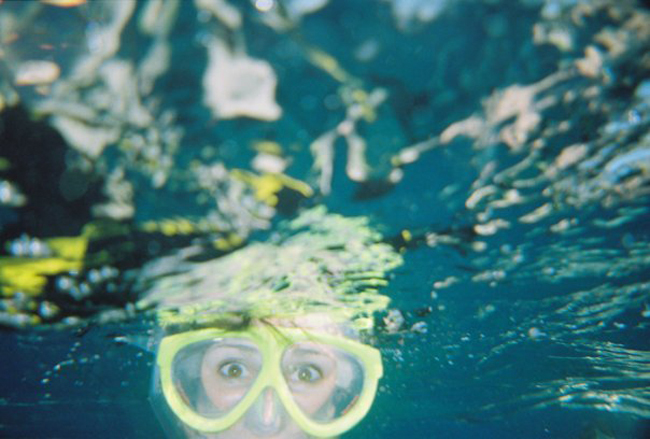 It was also my first time snorkeling, hence the mixture of fear and elation on my goggled face. Expect many more similarly goofy photos soon! Oh, I really really like this photo! Have a great time! This photo is amazing, Ashley! I will be waiting for your photos anxiously!! Oh I like the stripy dress!